South Louisiana is one of my favorite fishing destinations. Very few places offer such a diversity of species to fish, both inshore and offshore. And very few places offer you such fertile water that ensures no one goes home without something in the cooler. Two of my favorite inshore species to fish are redfish and speckled trout. The author likes to use a Z-Man MinnowZ bait for speckled trout and redfish. Sometimes, though, unexpected weather conditions, especially a cold front and even windy conditions, can turn off a honey hole that you know typically holds fish. You've caught fish there before, and you can even see those reds swirling their fins. But nothing seems to entice them to take your bait. So, when all else fails, or in anticipation that the artificial baits won't work, don't leave home without a pound or two of live or dead shrimp baits. But before pulling out the live stuff, consider these techniques first. One of the most commonly used artificial baits for redfish and speckled trout is the spinnerbait. It seems every boat I fish on in south Louisiana has at least three to four rods that are rigged with spinnerbaits. There are quite a few styles of spinnerbaits to choose from, too, and I recently wrote about the Z-Man Original ChatterBait spinnerbaits, which is a killer-bait with the right color. But you can also buy a basic H&H Lures Redfish Jig Spinner and interchange any number of different colors and shapes of blades — gold, silver, even white blades — depending on the clarity of the water, and experiment with different jigheads and plastic baits for different results. Personally, I like using either a 1/8-ounce or a 1/4-ounce jig head with Z-Man MinnowZ baits or Berkley Gulp! Saltwater Mud Minnows. I also like 6 1/2 to 7-foot ultra-light or light rods rigged with 8 to 10-pound braid and lighter reels, either spinning or baitcasting, that have a smooth retrieve and a good cranking ratio. Try using Rootbeer/Chartreuse, Nuclear Chicken or black/chartreuse trails. They all work. Another technique for these rascals is a straight jig head with a plastic bait that is jigged off the bottom. Chances are you'll pick up some flounder, too, with this technique. But here's what really turn redfish and trout on the most...shrimp bait, alive or dead. And it's the scent that drives them crazy. Try using a simple floater, a double swivel, a leader of 18 to 20-inches long, tied to a jig head with a shrimp at the end. Hook the shrimp through the tail, avoiding the head; it will last longer that way. And alive is probably better than dead. But both give off a tremendous scent and that's what turns fish on. If it's meat you want, go with the shrimp bait. Joel Lucks is a full-time outdoors writer/editorial photographer/photojounalist. He is the Founder of Full Spectrum Media, a solely owned full-time editorial and photography firm specializing in the outdoor industry. He currently lives in Smyrna, Tennessee. 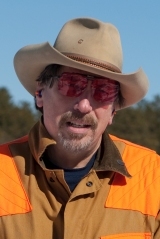 Published since 1991, he has written hundreds of articles over the years on fishing, hunting, boating and conservation. He is currently a Pro-staff member of Vanishing Paradise.org, a new initiative of National Wildlife Federation. He is a Field Editor for THE FISHERMAN magazine and has written for a wide range of print and online publications to include Outdoorlife.com, ESPN Outdoors Saltwater and Cabela’s Outfitter Journal. Joel is a graduate of the University of Arizona with a major in Agricultural Sciences, a past president of the New York State Outdoor Writers Association, a longtime member of the Outdoor Writers Association of America, a member of the Southeastern Outdoor Press Association and Tennessee Outdoor Writers Association. For more information visit www.JoelLucksMedia.com.